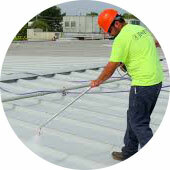 At The Flat Roof Company, we provide professional metal roof restoration throughout the St. Louis area for all commercial and industrial properties. Metal roof restoration is a cost-effective process designed to dramatically extend the life of your roof without the need for costly replacement. A complete restoration process improves performance by inhibiting rust, mending and preventing leaks and providing an energy-efficient, long-lasting finish on your roof for years to come. 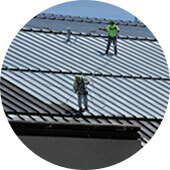 We utilize a 3-step metal roof restoration process with service before, during and after a project has been completed. Our roofing experts will thoroughly inspect and evaluate your existing roof to see if your property qualifies for restoration. Our professionals will prepare your roof by removing and cleaning all debris and dirt from its surface for restoration. Our specialists repair and strengthen your roof. We work to develop an effective plan to repair and maintain it's condition. We use industry-leading materials in our metal roof restorations to reinforce the durability and performance of your roof. The application of our protective coatings will help improve resistance to water and other conditions resulting from harsh St. Louis weather. As a trusted roofing contractor throughout the area, we stand by our work with a 100% Leak Free Guarantee provided to all customers. For more information about metal roof restoration and metal roof repair, contact us today to schedule a Free Inspection or call 314-995-2700. Flat Roof Co. has been serving the St. Louis area for over 30 years, providing quality flat roof solutions at affordable prices. We guarantee a roofing project complete to your satisfaction. We service a 100 mile radius around St. Louis, Missouri including Belleville and Granite City, Illinois.